With its origins dating back to 1921, the Minnesota Workers’ Compensation Insurers Association (MWCIA) has effectively served the workers’ compensation industry and its members through a wide range of services, products, systems and procedures. Moreover, through its numerous collaborations with a diverse group of industry organizations, including fellow workers’ compensation data service organizations (DSOs), MWCIA has been a leading voice in providing improved service to the insurance industry while better informing public policy decisions through our data analysis. The following is a review of significant turning points in the history and development of the MWCIA, so that you might develop a deeper understanding appreciation of our history, our role in the Minnesota workers' compensation arena and our position to improve the industry in the future. While it may be hard for today’s worker to imagine, there was a time when even the notion of workers’ compensation didn’t exist. Until 1911, injured workers were basically on their own with no recourse or remedy for their injury available from any outside source, including their employer. Employment laws of the early 20th century were such that the only way a worker could seek compensation for his on-the-job injury was to sue his employer for negligence, a bold and oftentimes futile effort. The burden of proof was on the injured worker and without the corroboration of his co-workers (who risked being fired if they testified on his behalf), the injured worker had little prospect of proving his case. These three defenses made it nearly impossible for a worker to successfully sue an employer. In many situations, the employee was left with neither a remedy to his injury nor the means of replacing his lost income. It wasn’t until the early 1900s that states began to adopt employer liability laws that either modified or eliminated the three common law defenses. While these changes greatly benefited workers, an injured worker still had to prove the employer negligent – a feat that in most cases was simply insurmountable. Consequently, injured workers, men and women who were missing a hand or a foot or often a limb, were forced back into the workplace to support themselves and their families. With the United States becoming increasingly industrialized, it was clear something had to be done. The State of Wisconsin was the first to respond to the call. These Absolute Liability Laws, as they came to be known, provided protection for the employer as well since they outlined benefits and other important limitations that capped benefit and legal costs to employers in addition to providing “no-fault” protection for injured workers. Over the next 60 years, everything operated relatively smoothly. The MCRB submitted rate increases to its regulator, the Insurance Commissioner for the bulk of this time period. Following the Commissioner’s approval, rates (including marketing, underwriting expenses and profit margins) were set and prescribed to member carriers. Injured workers were entitled to a fixed schedule of benefits and a method to establish insurance premiums to adequately fund those benefits and provide a predictable profit to carriers was developed. The result was a very stable workers’ compensation environment with low and stable benefits and little political interference. In 1972, the National Commission on Workers’ Compensation study prompted dramatic law changes that expanded and liberalized access to benefits. Beginning around this time, judicial decisions accumulated which generally ruled in favor of awarding benefits to injured employees, a “liberal bias” became built in to the administration of workers’ compensation to counterbalance a perceived low level of statutory benefits. 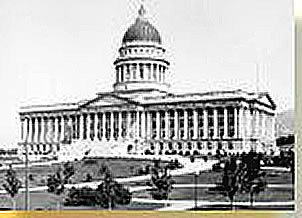 Simultaneously, the political makeup of Minnesota shifted to Democratic control of the Legislature, prompting major benefit expansion beginning in 1975. In addition to the expansion of benefits, rising inflation began to take its toll on all businesses and industries. The workers’ compensation industry in Minnesota was doubly affected because of the escalation in long-term pension cases resulting in large loss ratio increases. That, in effect, threatened carriers’ invested reserves, prompting fears of insolvency if the worst case scenario of an increasing incident of progressively more expensive claims occurred. While premiums were generally collected in earlier times to provide a future stream of loss benefits, those losses often outstripped the premiums collected, leading to later year loss cost development which led to higher rates. Minnesota was quickly becoming a high premium/cost crisis state. In response to the actuarial projections of dramatically higher benefit costs, the MCRB asked the Insurance Commissioner for a 67.5 percent overall average rate increase in 1977. The request prompted Legislative hearings the results of which led to changes in the rating bureau, including its name change to the Workers’ Compensation Insurers Rating Association of Minnesota (WCIRAM). Eventually, the Commissioner reduced the request leaving an increase of roughly 30 percent in 1978 – substantial by past comparison, but still insufficient to meet the effects of rising benefit costs. As a result, WCIRAM sought an additional increase of 28 percent in 1979 which was opposed by some employer groups. These groups challenged the cost projections underlying these requested increases and argued, among other things, that increased investment earning on reserves would offset a large part of the costs of paying claims. The 1979 rate request resulted in a lengthy administrative hearing, which included state-of-the-art analyses of the effects of investment income and the actuarial projections of benefit costs and future expenses. These issues took more than two years to adjudicate with the Commissioner finally reducing the increase to just under 12 percent. In July 1981, the Legislature forced an across-the-board reduction in rates of 15 percent due to some marginal cost containment amendments resulting in a net rate reduction (from 1978 levels) of about five percent. In 1983, WCIRAM asked for another increase, this time of nearly 30 percent. It fell on deaf ears. While employer groups challenged the pricing approaches that had traditionally been used to set premium levels in Minnesota, there was a growing realization that certain benefit levels and more particularly, access to certain benefits, constituted the majority of their cost drivers. The employer groups then led a charge to make substantial changes in the Minnesota Workers’ Compensation system. Representatives of the insurance industry understood that a drive for benefit change was most appropriately to be led by the employers and not by the suppliers of coverage, understanding that there would be difficulties in advocating a benefit-cutting stance on their part. The industry elected to compile and dispense more and better information while building coalitions with its colleagues, the Legislature and its audiences. WCIRAM became a key player in this process of public education. WCIRAM’s projections of the cost impact of various potential changes in benefit levels were viewed as a credible source for assessing such changes, which allowed employers, the industry and the Legislature to reach the hard policy decisions needed. The rate reduction mandate was ultimately ruled constitutional and the new rates went into effect leaving the carriers even more challenged as they grasped for ways to meet their benefit payment obligations in a hyper-inflationary environment with substandard rates. (Before subsiding in 1983, interest rates would top 22 percent). As if these difficulties were not enough, an anti-trust law suit brought by an individual and later certified as a class action case claimed that leading carriers were setting rates and were boycotting any other carrier that did not agree to adjust its rates comparably. The case was eventually settled but not without spurring dissent about how it should be handled, substantial legal costs and millions of dollars in settlement payments by the individual carriers named in the lawsuit. These requested rate increases, the mandated adjustments, the lawsuits all pitted the Legislature, employers and the industry against each other as never before or since. The parties struggled to find a solution that would insure stability and fairness. The goal was to remedy the imbalance between benefits and premiums and to give Minnesota businesses reasonable predictability as to what their future workers’ compensation premiums would be. The Open Competition system that we know and use today was put into practice. The new Association would continue to collect policy information and issue a ratemaking report but the focus of these efforts was fundamentally changed. No longer would the Association establish fixed rates for all carriers. Rather it would determine loss costs, i.e., “pure premium rates”, on which carriers would add underwriting costs, state taxes, fees and assessments to arrive at their respective company’s rate schedules. Carriers could further adjust insured premium via the use of individual rating plans. These changes effectively removed the Association from the politics of the ratemaking process and established a system that has worked well for the past 32 years. 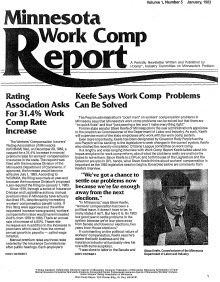 While the Ratemaking Report serves as an excellent objective barometer for the health of the workers’ compensation system, ongoing work and initiatives by other key players (the employer community, organized labor, the Insurance Federation of Minnesota, the Minnesota Department of Commerce (DOC), the Minnesota Department of Labor and Industry (DOLI) and the Minnesota Legislature) have further assured the system’s current stability and predictability. Established the permanent Council on Workers’ Compensation consisting of 12 voting members known as the Workers Compensation Advisory Council (WCAC). The WCAC is charged with submitting its recommendation regarding changes to Chapter 176 to the legislature. As a result, Minnesota workers and employers have benefited from significantly lower pure premium rates – on average, 23 percent lower than in 1984 when the first Ratemaking Report was released. This has translated into significant savings for all parties and contributed to the overall strength of the State’s economy and competitiveness. Beginning in the mid-1980s and continuing today, MWCIA has expanded its value and prominence in the industry by constantly seeking ways to provide a wide range of services to its members. While the Ratemaking Report remains its centerpiece, the Association began to partner with similar data collection organizations in other states to develop improved systems for gathering statistical information, for better carrier reporting and for streamlining virtually every aspect of the ratemaking process. This early collaboration with the state associations of Wisconsin, North Carolina and Hawaii led to the creation of Spectrum, a product so named because it enhanced Minnesota’s internal data reporting system known as PRISM – as if to shine light into it thus producing a spectrum. Continually being improved, Spectrum demonstrated that these organizations can effectively work together to improve the system as a whole. As a result, an array of products, systems, services and procedures are now in place to improve virtually every task facing the industry. And new products are constantly coming on line as the industry evolves. While collaborating with other associations, MWCIA has made the most of technology over the past two decades. All of these advances, especially those in the past two decades, have come about because of a constant focus on providing value and relevance to our members and the entire workers compensation arena. We continually ask our membership what is needed to make their jobs easier, truly listening to their response, then marshalling all of its resources to address those needs with the creation of products and services that advance the industry for all parties. Over the past 30 plus years, we have established a reputation of credibility and trustworthiness which allows us to serve the industry as an unbiased and accurate provider of workers compensation data and trends. © 2001-2019 Minnesota Workers' Compensation Insurers Association, Inc.